(Nanowerk News) Rice University researchers discovered that putting nanotube pillars between sheets of graphene could create hybrid structures with a unique balance of strength, toughness and ductility throughout all three dimensions. Carbon nanomaterials are common now as flat sheets, nanotubes and spheres, and they’re being eyed for use as building blocks in hybrid structures with unique properties for electronics, heat transport and strength. The Rice team is laying a theoretical foundation for such structures by analyzing how the blocks’ junctions influence the properties of the desired materials. Rice materials scientist Rouzbeh Shahsavari and alumnus Navid Sakhavand calculated how various links, particularly between carbon nanotubes and graphene, would affect the final hybrid’s properties in all directions. They found that introducing junctions would add extra flexibility while maintaining almost the same strength when compared with materials made of layered graphene. Their results appear this week in the journal Carbon ("Junction configuration-induced mechanisms govern elastic and inelastic deformations in hybrid carbon nanomaterials"). 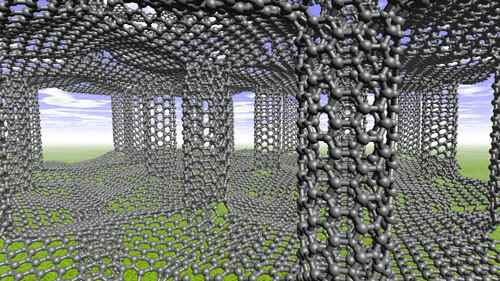 Carbon nanotubes are rolled-up arrays of perfect hexagons of atoms; graphene is a rolled-out sheet of the same. Both are super-strong and excel at transmitting electrons and heat. But when the two are joined, the way the atoms are arranged can influence all those properties. To that end, the lab assembled three-dimensional computer models of “pillared graphene nanostructures,” akin to the boron-nitride structures modeled in a previous study to analyze heat transfer between layers. Layered sheets of graphene keep their properties in-plane, but exhibit little stiffness or thermal conductance from sheet to sheet, he said. But pillared graphene models showed far better strength and stiffness and a 42 percent improvement in out-of-plane ductility, the ability to deform under stress without breaking. The latter allows pillared graphene to exhibit remarkable toughness along out-of-plane directions, a feature that is not possible in 2-D stacked graphene sheets or 1-D carbon nanotubes, Shahsavari said. The researchers calculated how the atoms’ inherent energies force hexagons to take on or lose atoms to neighboring rings, depending on how they join with their neighbors. By forcing five, seven or even eight-atom rings, they found they could gain a measure of control over the hybrid’s mechanical properties. Turning the nanotubes in a way that forced wrinkles in the graphene sheets added further flexibility and shear compliance, Shahsavari said. When the material did fracture, the researchers found it far more likely for this to happen at the eight-member rings, where much of the strain gathers when stressed. That leads to the notion the hybrids can be tuned to fail under particular circumstances.